I travelled northwards on Monday night, with the intention of becoming a surprise guest at my Dad’s 60th birthday, and expanding my knowledge of all things malt. Obviously the best approach to this would be to sample as many as I could, and thanks to my father’s generosity and extensive collection, I managed to do just that. 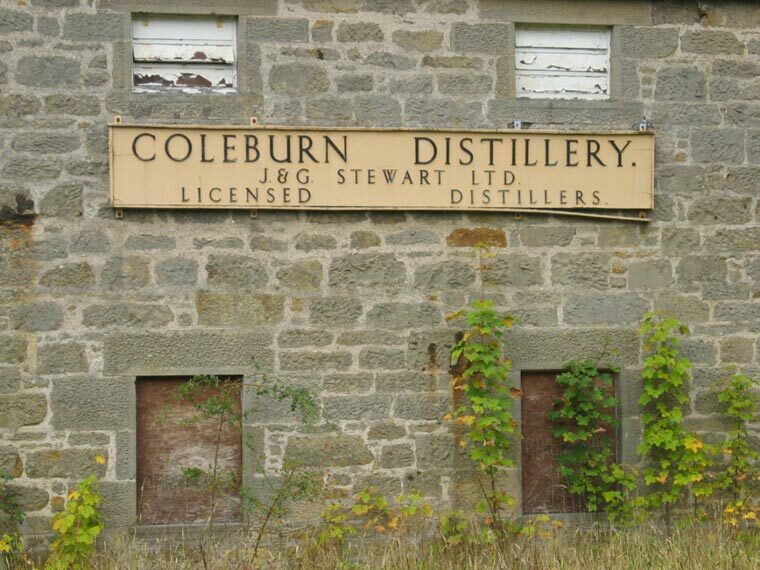 My parents live in Manager’s House at Coleburn Distillery, which is situated just south of Elgin, snugly nestled at the foot of some impressive timber and farmland. It’s bang in the middle of The Whisky Trail, and you could quite happily spin someone round blindfolded, and then send them off in a straight line in any direction, and before long they’d have a dram in their hand. No shortage ’round there. So I arrived at my folk’s place at about eleven o’clock, and realising that I couldn’t just walk up the gravel drive, as that’s in direct view of the house, and my surprise visit would end up just being just a visit. So approaching from the rear of the house, I tried to cross a field, which revealed itself to me as being not quite as solid as it first appeared. Limiting my curses, so as not to give the game away, I extracted my sodden legs from this knee-deep bog and continued up a short hill to the front door of the house. I deposited two bottles of Glenglassaugh 1976 30 year old (there was no way I could afford a 60 year old…) on the doorstep, chapped the door loudly and ran round the corner. I watched with some amusement as my Dad tried to work out, where the whisky had come from and why the dog had not announced The Arrival Of The Postman Or Other Interloper. I let him do some head-scratching before I appeared from ’round the corner, and whilst he was looking away from me, launched myself onto his back. I made a note that this is not a good thing for sixty-year old people. Once the terror had gone from his eyes, I think he was pleased to see me, and either the shock, or sense of occasion warranted a stiff drink. The ‘glassaugh was cracked open. Clothes drying on a sunny day, loads of citrus, freshly mown grass – if there’s such a thing as a summer malt, then this is in that category. Lovely. 13:00 I’m on the computer upstairs, trying to use my limited tech knowledge to install a few things on my Dad’s PC. He tries to throw a spanner in the works by placing a Macallan 25 year old in front of me! How can I work in these conditions? Never mind that it’s an unfathomable W*ndows machine, and that I am to IT what Arnie is to figure-skating… But it’s his birthday, and I can’t disappoint. 16:00 I’ve been asleep for about half an hour, dozing happily with a library of whisky books and magazines to trawl through surrounding me. I awake and succumb to my phenol habit. I want an Islay and I want one now. Not wanting to sound like a spoiled brat, I ask my father nicely if there’s one going by any chance (of course there’s one going, he loves them too…). Phenol is the compound found in the peat smoke which adheres to the malted grain during the drying process. It will only stick though if the grain is moist, so you’ve to be careful and not dry your malt too fast. Amongst distillers, they talk of phenol in parts per million, or ppm. Most Islay malts are around the 30 – 50 ppm, but apparently there’s something called Octomore from Bruichladdich, which sounds more supervillain than whisky to me, and that’s about 60 ppm, so I’m looking forward to trying that when we venture there in September. Port Ellen reputedly once managed an ‘experimental’ malting at 100 ppm. Wow. I can but dream. Anyway, I ended up with an Ardbeg Uigeadail. Great stuff. Old car interiors, old books, like your Granda’s loft. Obviously loads of peat, but tempered by the mix of bourbon and sherry casks used in this creation. I loved it. 21:30 So we’ve been out to the very grand Castle Hotel in Huntly for my Dad’s 60th Birthday Meal. Great night, and always lovely to spend time with my family. After I’ve expanded the girth of my waistline substantially, we go though to the lounge bar and my Dad orders the after-dinner drams. So we get one each, going the route of both trying something different in order to get as much experience as possible from what’s on offer, like stereotypical tight Scots. I let my Dad surprise me. I’m trying to get better at my blind tasting, but so far all I can identify with much certainty is if it’s Islay or Speyside, and even that can be tricky with some of the more peated expressions that seem to be fashionable with most distilleries at the moment. Though from a personal point of view, I can think of worse things to endure than a phenol zeitgeist. So I established it was a Speyside, and then that was it. I had to be put out of my misery(?) and told that it was the Rare Malts edition of a 20 year old Mortlach. It was a lovely dram, but I didn’t get as much from it as I felt I should. It was beautifully smooth, reminding me immediately of the Macallan 25 that I’d had earlier in the day, but apart from the sweetness, sherry, heather blossom, honey and a tiny hint of brine, it seemed somewhat underwhelming. Now I think that I’d like to revisit that at some point as I’m sure my palate was a bit worse for wear after what it’d been put through that day. I then tried the other whisky, and it was likened by both myself and my Dad to ice-cream. Heaps of vanilla, very smooth on the tongue, but spicy and rounder in the finish, like it changed into a cake on the way down. Turns out it was a Glenmorangie 15 year old Sauternes finish. 11:00 Back home at my folks house, my Dad pulled out the special stuff. 21 year old Rare Malts edition of a Coleburn – cask strength. My Mam rolled her eyes, and said “Ye’ll a’ be tooteroo…” and wandered up to her bed, knowing that much nonsense was about to be talked, with not one, but two whisky-bores in her household. That Coleburn’s something else. A Speysider through and through, but with enough guts in the bottling to make you think twice about what it is you’ve got in your hand. It’s prickly on the nose, chunky on the palate, and there’s a short-lived blast of peat in amongst it all as well.